For your scalp areas that need extra help, and for your hair areas where split ends, slow growth and breakage are a real problem. 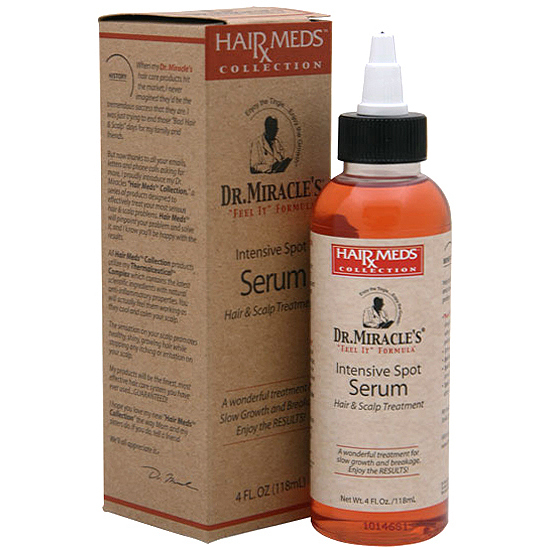 "Feel It" Formula tingling sensation should be used directly on your scalp where you have the most slow growth problems. Stimulates blood flow to the scalp. Also shines, conditions, strengthens and moisturizes. Continues to work even after you stop feeling it. Excellent on relaxed, braided, weaved or natural hair. For best results use twice a day. First, place a small amount of Intensive Spot Serum onto your hands and gently massage into the scalp areas with the slowest growth problems. Now enjoy my "Feel It" Formula. Next, use on the ends of your hair to help end split ends and breakage. Lastly, use a small amount on the rest of your hair for fabulous shine and as a wonderful moisturizer and conditioner. Leave in and do not rinse out. Style as usual.